Poultry has a simple idea of family and it’s one that sticks with us. Turkey day is family day. People flock home, wherever they conceive that to be, every fourth Thursday of November. For us older thankers, memories of turkeys past always hatch out again too, reborn from some undiscovered country to whose bourn all travelers return year after year. I wonder how many turkeys our family has eaten since my son Jack joined us 22 years ago. The farm-raised ones, I mean, not the wild turkeys which in recent decades have been proliferating, according to the accounts and to how often they slow Bonnie and me down while they cross a road, or wend the driveway single file into the woods. Turkeys, like most birds it turns out, are quite family oriented. A book that has stayed with me, “Illumination in the Flatwoods,” describes Joe Hutto’s experience saving a few orphans from oblivion. In his wooded North Florida neighborhood (about the time Jack came into the world, this was) a forestry effort was under way to improve quail habitat by cutting down pine trees and eliminating hardwood transition areas. Good for the quail, but bad for the turkeys. Their nests were getting destroyed. So after a conversation with a local farmer, Hutto found on his doorstep one May morning a clutch of live turkey eggs. He took them in and makeshift incubated them. The memorable part of the story is the little turkey poults hatching out. They don’t just break free of the eggshells, wander around dazed, then grow up. They look around for Mom or Dad. In his description, the newborns are frightened until they spot and make eye contact with an adult protector. This is called imprinting. So in the barn, each one would see him peeking over the tabletop and run to his face, stare into his eyes, then nuzzle up against him and fall happily asleep. After that, their poulthood included peeping happily whenever he appeared, running to him and crowding around him. He’d lay down with them and they’d push their fuzzy little beaky faces into him, nestle down, and sleep. He spent the summer and fall taking them for walks, protecting them from snakes, weasels and hawks, and generally being their parent. For at least two years he was apparently the poults’ notion of a family. You have to think that in a turkey’s mind, this is not a terribly complicated notion. Powerful with turkey emotions and instincts, no doubt, but not complicated. In humans, on the other hand, a webwork of memories, feelings, hopes, thoughts and other inner experiences that turkeys (presumably) do not have is integral to our sense of “family.” Including, weirdly, eating turkeys in November. “It was a cold February day, and we had just come home from town. My 5-year-old nephew, Zachary, was with us. He was excited to have ‘a sleepover’ with us at our house in Troy. We gathered up the groceries and Zachary’s things from the car, and started to head inside. Then Zachary stopped, staring curiously down the driveway. He pointed and said, ‘What’s that?’ They were turkeys, or wild turkeys to be exact. “There were several of them. A few were making their way through the deep snow, a couple perched in a nearby tree. I was amazed when a couple of them took off flying. In fact, turkeys can fly up to 60 mph, and as far as about a mile per flight. It was not unusual to see so many turkeys together all in the same place. They require lots of mature hardwoods, more specifically the nut producing species (like oak or beech), along with pines. 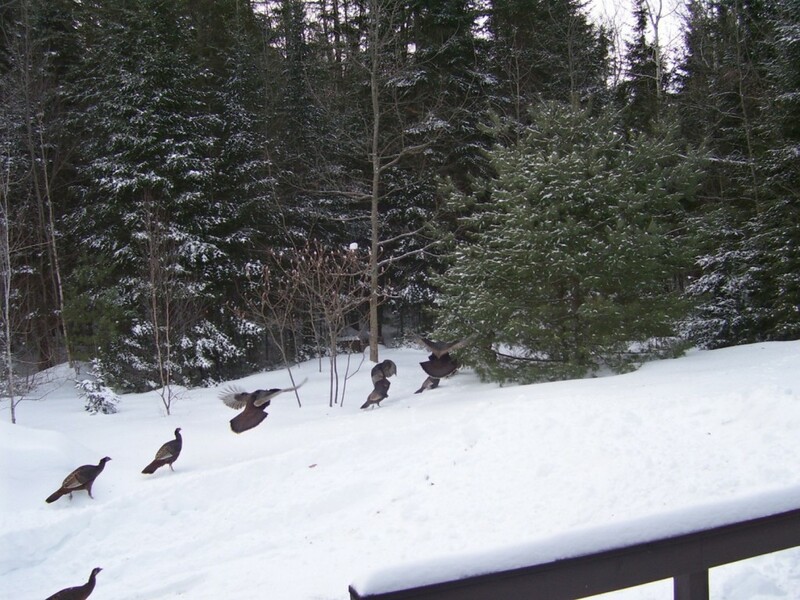 This makes Maine (and our backyard) a prime location for turkeys. 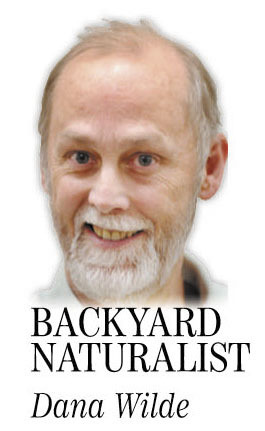 “Early in Maine’s history, Eastern wild turkeys flourished in York and Cumberland counties. By 1880, though, much of southern Maine had been cleared of trees and 90 percent was made up of farmland, so the wild turkey population plummeted. This, and unrestricted hunting were thought to be the two major factors. “Later, as farming declined, the woods regrew. Now, farmland in those areas covers only about 15 percent, and attempts were made after World War II to reintroduce wild turkeys. In 1977 the efforts succeeded. In the 1980s more turkeys were brought to Waldo and Hancock counties, and (in 2006) the state’s wild turkey population is estimated to be around 40,000 birds. Jack gave up writing in favor of less contemplative activities, but this little achievement of course has lived close to the surface of my memory for years. Every November I remember it. I devour it, actually. Quite thankfully. It’s a little oviary of all that is, or ever was, or will be.